Communicating science is important, and there are plenty of ways to improve. Improv is a theatrical technique that can help scientists tell better stories, understand group dynamics, and say yes in the face of the unknown. Former UT graduate student Nichole Bennett has started hosting a STEMprov workshops to help STEM folks improve how they communicate with different audiences. 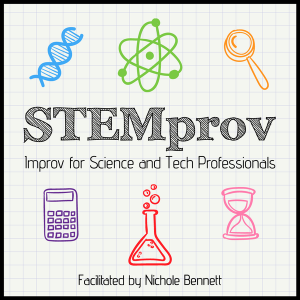 Let me tell you about two of my favorites improv games Nichole taught that can be used to specifically improve science communication. Yes but example: It would be awesome to build an automated video tracking system! Yes, but John already tried it and it failed. Yes, but you can’t do that and graduate on time. Yes, but we don’t have the money. Yes and example: It would be awesome to build an automated video tracking system! Yes, and John could give you some advice. Yes, and this would really enhance your thesis. Yes, and we can apply for a technology grant to support it. I’d like to have a lab meeting where we brainstorm and only provide positive feedback before we perform a more critical analysis of ideas. Let us know if you’ve ever tried this. Once upon a time ___. Every day, ___. One day ___. Because of that, ___. Because of that, ___. Until finally ___. And, ever since then ___. I think these are perfectly adaptable for science storying because it isn’t that different from the introduction, results, conclusions format we are used to using, but it is much more compelling. In the story spine, the world exists in a certain way with routines, but then sometime changes and there are consequences. Finally, there is a resolution and now the world is different. After the workshop, I wrote a very short story spine about my career trajectory here. I encourage you to write a story spine today and tweet it to @BEACON with the hashtag #STEMprov.